Add the honey and sugar to a small pot at medium heat and stir with a wooden spoon until the sugar melts completely and the ingredients are well combined, about 4-5 minutes. Then add the peanut butter, teaspoon of vanilla extract and teaspoon of sea salt. Place the bags of popcorn in the microwave one at a time; it should take about 2 1/2 minutes to cook each. While the popcorn is hot, mix with the honey and peanut butter. Place them on a tray and spread them out to cool. Transfer to a deep bowl, add the chocolate chips and banana chips so they mix and stick to the popcorn. If you don't have microwave popcorn, then add vegetable oil to a medium pot at medium heat and add about 1 cup of kernels. Cover until they've popped. Move occasionally to distribute evenly. I don't recommend using the popcorn button on the microwave because they usually take less time than the machine indicates. When there are silent intervals between the popping, stop the microwave so they don't burn. You can also add 1/2 cup of peanuts when you add the chocolate and banana chips. Popcorn is truly an addictive snack. They're popular throughout the world, ideal for movie nights, watching TV, sports or whenever you get the craving. Personally, they calm my anxiety so the convenient microwavable packages are never missing from my pantry. Usually I watch what I eat and adhere to a strict diet. I snack on popcorn, but only with salt. I like to avoid butter, though it is a delicious addition to popcorn. Most people are only familiar with a couple of versions of popcorn: with salt or with salt and butter. Others prefer white cheese or cheddar powder on them, while some prefer caramel. If you are looking for new and delicious recipes, give this popcorn recipe a try. I bet you've never thought of breading prawns with popcorn or adding a layer of popcorn to macaroni au gratin. 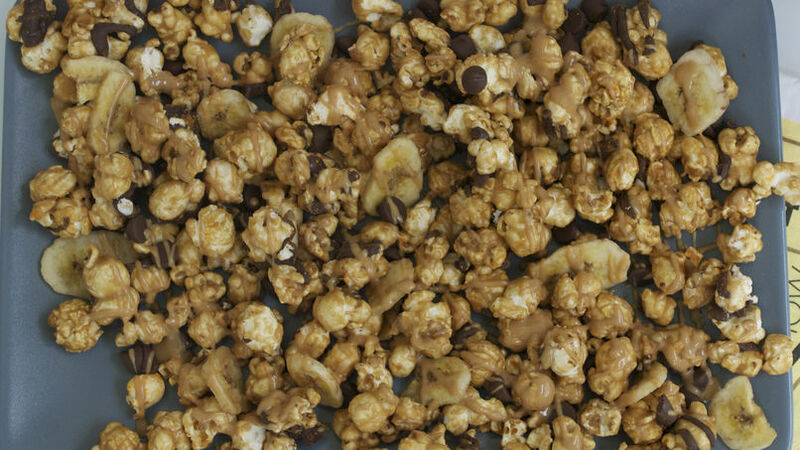 I'll share these recipes with you later, but for now I want to show you my recipe for popcorn with chocolate chips, peanut butter and banana chips.